Nattō – to many, its texture and smell would normally indicate the presence of something that needs to be cleaned up – preferably by somebody else. But those qualities are fairly common among fermented foods. Certain cheeses and types of preserved fish, for example, may well seem better candidates for burying than eating. Fermented foods, however, offer many health benefits, and tastes for even the less appealing among them can be acquired. Nattō, as the product of fermentation, is made by applying bacteria, Bacillus subtilis, to boiled soy beans. 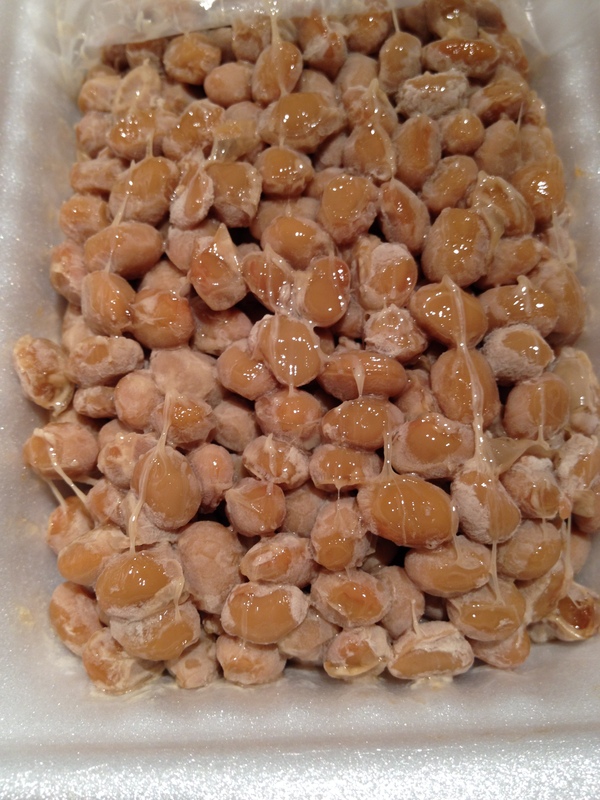 It is the action of these bacteria on the cooked soy beans that produces the characteristic slime and smell of nattō. More specifically, the process of making nattō produces the compound, pyrazine, which is responsible for the slime and is said to help thin the blood and reduce the formation of blood clots. Nattōkinase, an enzyme, also helps to thin the blood – while making that nattō smell. Other nattō health benefits come from vitamin K – which is necessary for strong bones – protein, calcium, and a long list of other nutrients. And, as if that were not enough, nattō boosts the population of healthful gut bacteria, while suppressing the population of harmful bacteria, and gives regular eaters of nattō extra protection against food poisoning and the ill effects of an imbalance in gut flora. With all this going for it, it’s no wonder that many Japanese have come to regard nattō as an essential element of their breakfast table.